So here’s my dilemma, does the whole no white jeans before Memorial Day rule still stand? I’m thinking of packing some white jeans to wear this weekend for Easter. I (unfortunately) will not be in the white pants capital of the world, Florida, BUT the weather will be 50s and Sunny! 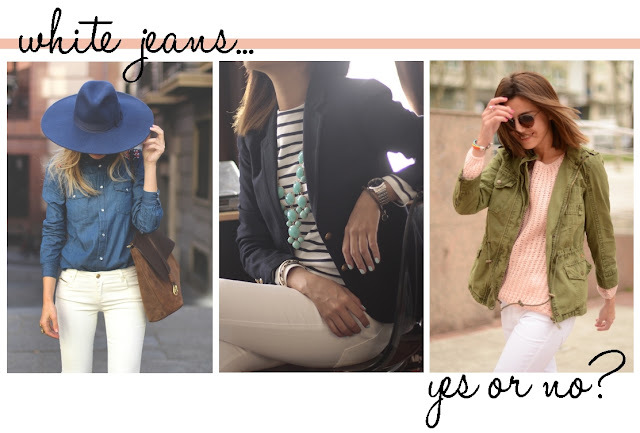 So what do you think, white jeans are pack-worthy for Easter weekend? Absolutely! I think pulling out white jeans has everything to do with the weather and nothing to do with the last weekend in May! I would prob only wear white jeans with heels, flats, or sandals so those type of shoes correlate with warmer weather! ha! I was totally asking myself the same question this past week and as you saw…I went for it! Break the "rules" and wear what feels good. I love, love your inspo pics especially the one with pastel pink!